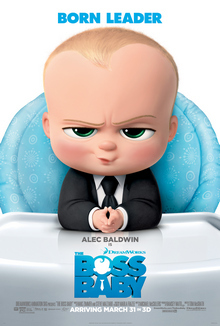 The Boss Baby is a 2017 American computer-animated comedy film, loosely based on the 2010 picture book of the same name written and illustrated by Marla Frazee. Produced by DreamWorks Animation, the film is directed by Tom McGrath and written by Michael McCullers. It stars the voices of Alec Baldwin, Miles Bakshi, Steve Buscemi, Jimmy Kimmel, Lisa Kudrow and Tobey Maguire. The plot follows a baby who is a secret agent in the secret war between babies and puppies. The Boss Baby premiered in Miami on March 12, 2017, and was released by 20th Century Fox on March 31, 2017 in the United States. The film received mixed reviews from critics and has grossed $437 million worldwide against its $125 million budget, making it the fifth highest-grossing film of 2017.